2. How many char­ac­ters do you have? Oh, an untold number of characters live in my head, awaiting their turn to be written about. But I’ll stick to the ones in PORTRAITS since they’ve been fully realized. 1. Anne- My fiery 19 year-old protagonist. Lover of penny dreadfuls and Gothic Romances. Upon discovering her ability in communicating with the dead, she sets her ambitions on becoming a prominent medium. 3. Beth- Daphne’s taciturn younger sister. Artist and poet. Very strange objects can be found hidden in her room. The preeminent Ralfast (waves hello) has tagged me for a meme in which I am to answer 30 questions related to writing. 1. Tell us about your favorite writing project/universe that you’ve worked with and why. Why? It’s the first novel I wrote with the specific aim toward publication. Wait. No. That’s sort of a lie. But unlike the Little Women knock-offs I penned when I was ten, I think this at least has a slight chance in Hela. The “universe” that the story takes place in is very tight. I wanted the setting to be claustrophobic. The majority of the novel takes place around one desolate house. Outside, it’s glorious summer, while inside, the house’s inhabitants are wilting. I’d speak more in depth about the novel, but no doubt with 29 more questions to go, I have plenty of time for that. 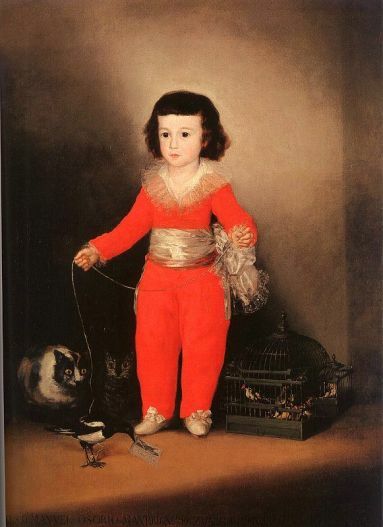 This painting with the child holding a bird captive, and two cats waiting to pounce upon it hangs in The Hoffmans’ dining room. The renowned English artist went mad during his travels through Europe and the Middle East. After claiming possession by the Egyptian god, Osiris, he began exhibiting increasingly violent behavior. Upon Richard’s return home, his father refused to instituionalize him. Not long afterwards, on August 28, 1843, Richard Dadd stabbed his father to death. 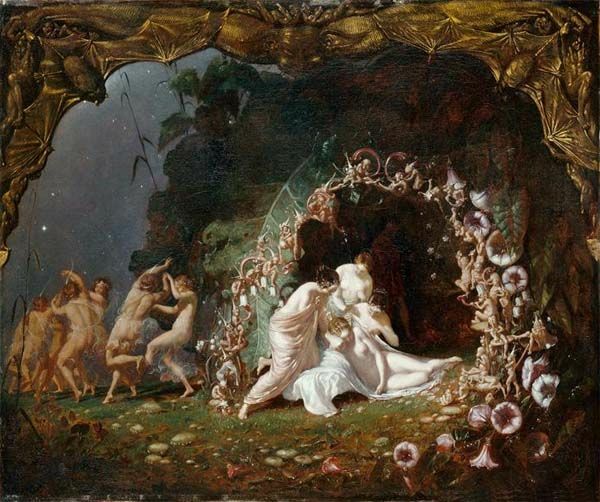 Richard Dadd spent the rest of his life in a mental institution. Do paintings inspire ideas in you? This morning I closed my eyes, shuffled the Faeries Oracle deck, and withdrew Luathas the Wild. “Luathas the Wild is filled with fire, and fire is associated with the creative life force. This faery fires us up, gets us going, recharges our batteries and creative energies. He likes to be around when things are exciting, when there is life force blazing high and he can jump in and encourage it to burn even higher. Creation and passion are his bailiwick.”- from Brian Froud’s, The Faeries’ Oracle. As I take notes, the creative side of my mind is twirling with ideas. It is indeed a fun, wild time when it comes to my writing. What is in the cards for you and your writing? Things are very exciting right now. I have a full out on POTL (whispers this as not to upset the Fates), and have started researching and taking notes on my next supernatural suspense novel. Before blogging about the new novel, I wanted to write a couple of posts regarding Portraits, which will then be put together in a separate page. 1. Anne Durrant: fifteen-years-old, imaginative, clever, intelligent, yet often foolish. Definitely not as sensible as she believes. Booksmart, but has a lot to learn about the dangers of real life. Her insatiable curiosity is both her greatest asset and her worst, for it might get her killed. . .
2. Daphne Hoffman Stowe: thirty two- years-old, married, highly intelligent, poised, and stoic. Loves science, history, and linguistics. Despite her scientific leanings, she is addicted to having her fortune read. Fears an ominous reading from a Gypsy. . .
3. Beth Hoffman: Daphne’s younger sister. The reticent spinster loves art, poetry, tarot cards, and waxen dolls. . .
4. Gerard Hoffman: Anne’s uncle. Father to Daphne and Beth. Scholar of the Occult. What does he do in his study? 5. Sheridan Stowe: Daphne’s husband. Uses his charm to get away with his drinking and gambling. What does he feel guilty about? 6. Grace Cullwick: the utterly devoted house maid. The only servant who remained after an exorcism went frighteningly wrong. Tender to her “family”, she is cold to all outsiders. 7. Mr. Raferat: Family friend. Retired anthropologist. Studies the occult. Larger-than-life world traveler who relishes good stories and obscure facts. 8. Mrs. Brent: Widow. Not-so-discreet lover of Mr. Raferat. Devoted Spiritualist. Overbearing and a bit daft, but with a great heart. 9. Mary- the young servant girl who haunts the Hoffmans’ house. Who are the characters in your novel?